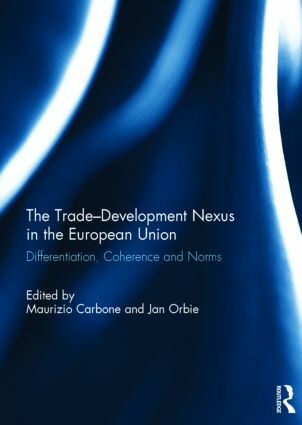 This volume offers new perspectives on the evolution of the trade–development nexus in the European Union against dramatic changes in the international context. Without disregarding them, it seeks to go beyond the controversial and extensively researched Economic Partnership Agreements (EPAs). In particular, it focuses on the reform of the Generalised System of Preferences, the negotiation of various Preferential Trade Agreements, the application of trade sanctions, the allegedly ambitious agendas on decent work, Aid for Trade and aid untying, and the implications of the changing balance of power in global economic relations. Taking diverse approaches and, at times, reaching different conclusions, contributors directly or indirectly address one or more of the three general themes of the book: differentiation, coherence, and norms. This book was published as a special issue of Contemporary Politics. Maurizio Carbone is Professor of International Relations and Development and Jean Monnet Professor of EU External Policies at the University of Glasgow. He has published on EU external relations, most specifically foreign aid, policy coherence for development, and EU-Africa relations. Jan Orbie is Professor and Director of the Centre for EU Studies at Ghent University (Belgium). He has extensively published on the European Union’s global role, including the trade-development nexus.